Abstract: Line source arrays (LSAs) are used for large scale sound reinforcement, aiming at the synthesis of highly spatial aliasing-free sound fields for the whole audio bandwidth. 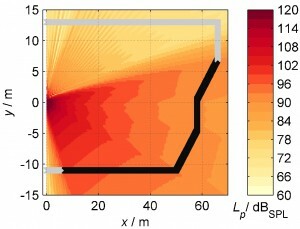 Numerical optimization of the loudspeakers’ driving functions can considerably improve the homogeneity of the intended sound field. In this paper we propose enhanced visualization techniques characterizing the array performance. This may lead to a more convenient interpretation of the LSA radiation behavior. By additionally recommended technical quality measures the LSA design and the optimization requirements might be improved. The approach is exemplarily discussed for fictitious LSA models. Based on a least-mean-square error optimization using a loudspeaker weight energy constraint, the driving functions are derived. It is shown by means of the visualizations and measures why this optimization scheme being common practice in sound field synthesis applications is inappropriate for the problem at hand and that spatial aliasing has a large impact on the synthesized sound fields. We recommend to incorporate the proposed quality measures as criteria for future optimization approaches. Feel free to download the presentation slides here.